You are currently browsing the tag archive for the ‘Fun’ tag. Have ever had one of those moments in a store when you weren’t looking for anything in particular but an idea exploded in your mind and a massive smile erupted all over your face? My bride and I were wandering through the Halloween costume department. It was my job to drive the shopping cart and navigate through the crowded aisles. Costumes, accessories and decorations hung from hooks and lined the shelves. But, my new granddaughter and 2-year-old grandson came to my mind. That’s when the imitation wigs and beards jumped out at me. “Naw, it’ll look fine. Just a moment of fun will be worth it!” I announced with all of the confidence of a far away displaced Grandfather could muster. Carefully, we put together a “care package” for our grandchildren. The brown cardboard box was plain and unassuming but the inside gifts would surely brighten up the day of our kids and their children. The post office received the package and posted it for the long 2000 mile journey. Busy lives have a way of pushing out of our minds expectations that are limited by long delivery dates. Thoughts of the glee that would erupt in the home of our daughter and son-in-law for their kids, our grandchildren, would have to wait for the delivery day. 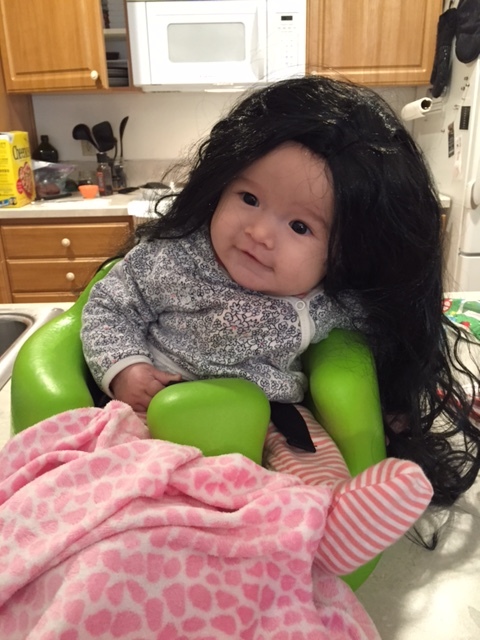 Work, goals and objectives siphoned off my delight and perhaps the biggest surprise was hearing from an email with the picture of our granddaughter in her new wig. I laughed. I kept on laughing as I shared the picture with my bride. God’s great gift of laughter is a treat! Together we smiled, pointed out details and marveled at this little life that captures our hearts. She has never had an understandable conversation with either of us. 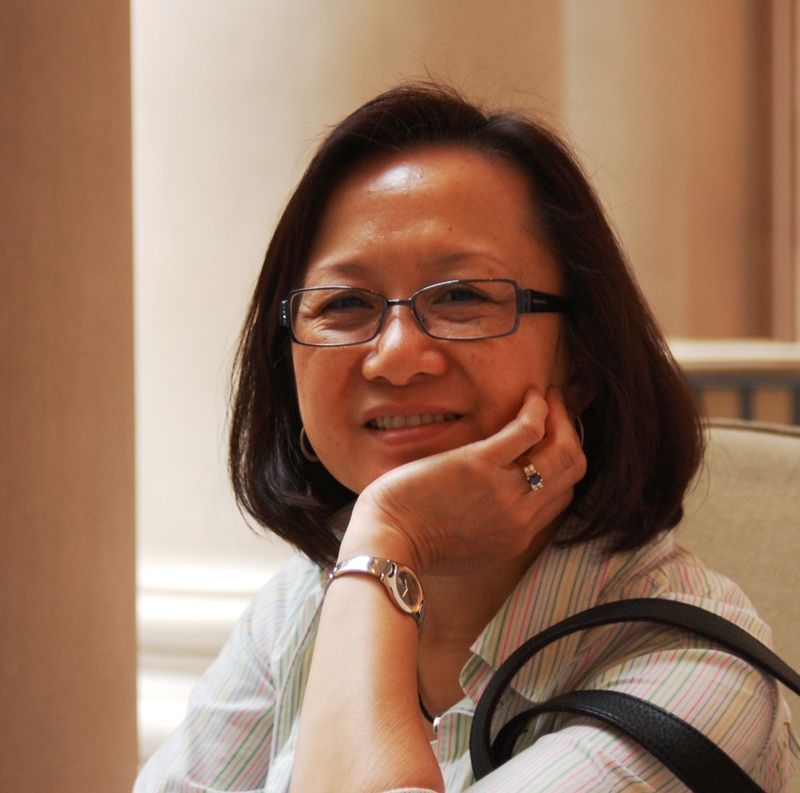 Nevertheless, we love her deeply. Now, that we can have some fun with a simple costume, the expanding options with our family time are multiplying like an explosion of creativity. I am loving all of it. Each day I am eagerly looking for more of it. There is a new dimension to life. We enter into the world of make-believe. It is sheer unbridled fun. My bride’s cellphone rang. I heard its distinctive sound from my second floor office. When she answered she was animated, excited and filled our home with laughter. Those sounds brought a smile to my face. Inside I felt the balloon of joy filling up. Before I was invited, I shut down my computer, moved my work into a manageable pile and stood up to close my office light. After two steps toward the stairs I heard the invitation. My bride’s familiar voice of 38 years of marriage beckoned me to come. Without her detailed explanation I suspected with anticipation that we had received an unexpected call from the grandchildren. “Coming!” I replied right away and energized my steps. It is beyond fun to approach the head of the stairs looking forward to interrupting my writing and research. Someone special was on the phone and I wanted to be a part of that conversation. Bounding down the stairs was not really an option. Young people can do that. I remember when I did but that is no longer a smart choice. I melted. My heart nearly burst. A grin took over my face. We chatted with this little guy for long moments. He showed us his new dump truck. Never leaving his left hand was on of his favorite toy cars. Then, our three-month old granddaughter was placed in the camera lens. She was sitting propped up by her infant chair. Snuggled in, she seemed content. Then, my bride began talking with her. She talked back! No intelligible words could be understood. But, the garbling, cooing and grunting made the appearance of a conversation with her and her grandmother. It was so special! This episode was our first Grandparent’s Day moment. First’s are amazing memories. FaceTime made it possible. The internet is a massive blessing to families separated by so many miles. No, I can’t bound down the stairs, no can I always figure out technology but I can surely enjoy this incomparable season of life. 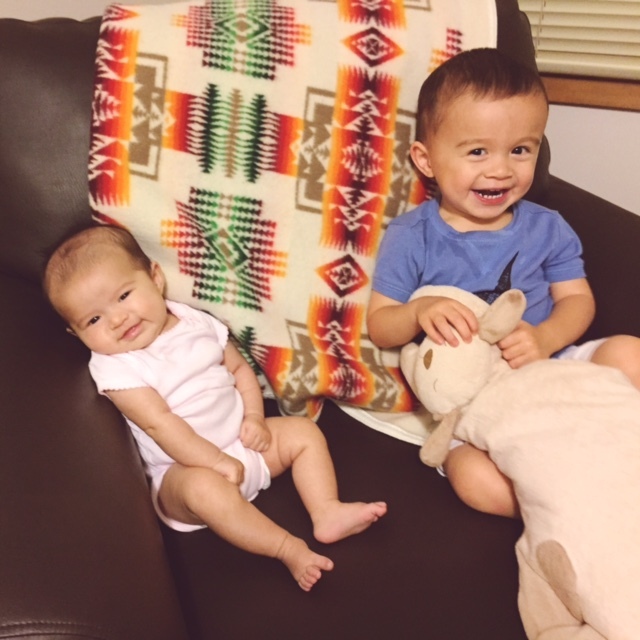 Being a grandparent is a joy unending. I have gladly traded some advantages of youth for this finest of human connections. They remind me of Twinkies. I hope that isn’t an insult. Health choices aside, Twinkies were a favorite treat when I was a kid. They tasted great, smelled great, never got wasted and were like a reward for finishing my bag lunch. Now, add eyes or eye, inject a massive amount of personality, add a generous dose of mischievousness and the collection of movie screen characters is born. Bib overalls give them a personality that is lovable. Goggles over a pair or cyclops eye is adorable. Feed in a sound track for their fast talking completely non-understandable dialogue but let interpretive gestures and episode contexts give meaning then something magical happens. I can’t forget the laughing. When the minions chuckle, I chuckle with them. Despicable Me movies add charm to this supporting cast of wonderful movie background supporting characters. I do love it when they laugh. Smiling is a natural reaction. There have been an abundance of trailers for the Minion Movie. But, it is one thing to be a hit as a supporting actor or cast. It is totally another thing to be the star. Most animated movies leave a lot to be desired. 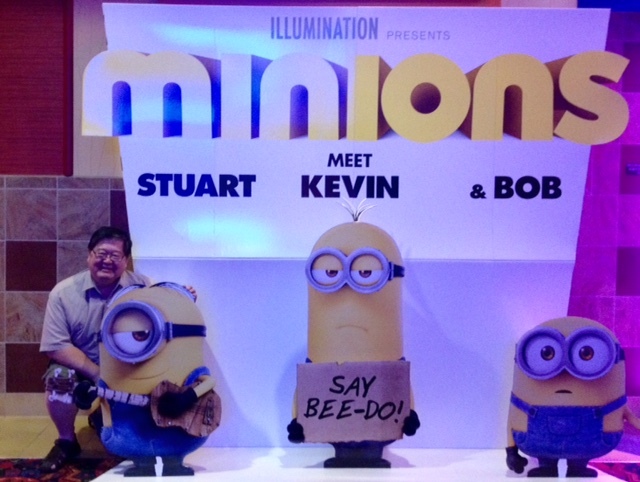 Even when the highly appealing trio of Bob, Kevin and Stuart lead the way. Maybe the critics will win me over this time. They are not kind about the movie. For the time being I will be content to have snuggled up to the trio of Minions during one their promotional trailers. I got down to their level and could only smile. You must be a Minion fan too, right? Are you going to see the movie? We were out for some fun and running errands. From location to location we steadily kept up our pace and systematically checked off all of the items on our Texas check list. The setting sun gave us the signal that the day was coming to an end. Our low growling stomachs reminded us that we had been depleting our energy reserves. It was past time for dinner and we had not planned anything for the evening meal. We looked up at the new strip mall where we were finishing up our day of errands and saw an interesting looking restaurant. The ambiance of the restaurant was splendid. Lighting was subdued but inviting. The decor was ethnic specific and well apportioned. Friendly smiles welcomed us and the receptionist led us to a comfortable table. The menus were fresh, sprinkled with pictures and the prices were acceptable. From a familiar list of options we placed our order. Pleasant conversation had us reviewing our day. We shared our reactions to specific events as we talked over this feature and that episode. Reliving what we had just lived that day is a part of what fun marriages do. The waiter showed up and presented my bride with her order. It was not just amazing. Instead, it was spectacular. We both pulled out our phones and began snapping pictures. Carefully, we turned the bowl at the best possible angle. Then, we checked the pictures and began moving glasses of water, napkins, salt shakers and other distracting items out of the shot. All through the process we shared our results with each other. Together we marvelled at the presentation. It made the event fun. 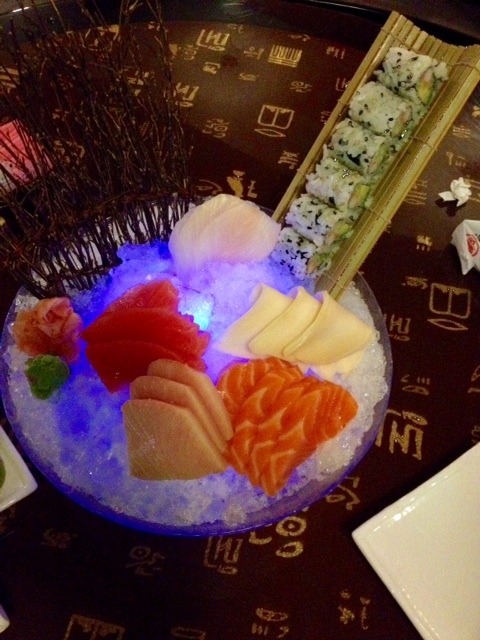 Presentation, fun and taste were now combined for a wonderful meal. A new restaurant was being added to our favorites list. What an enjoyable day this turned out to be. Life is like that. At least it should be. When God the giver of life graciously gave us the gift of life through Jesus Christ, He had every intention that it should be a splendid. Like any gift we would give, we look forward to the beneficiary to use the gift and thoroughly enjoy it. Are you loving life? God wants us to. That is why He gave us Jesus. Disney World is a special treat in and of itself. We dreamed of visiting this theme park for years. The savings started years ago to make our dream a reality. Finally, we booked the tickets, set aside the vacation days and anticipated the vacation. I emailed our travel agent countless times building this dream trip for our simple lives. Planning the trip was a big part of the excitement. In that planning stage I was introduced to the the Disney website. One of the features on the site was ordering a welcome gift that would be delivered to your room. It would be my secret for my bride. Scrolling through the options was like most online options. You could buy a gold plated Rolls Royce with a Mickey Mouse hood ornament or a candy bar with a Donald Duck sticker on it. The range was limitless. Winnie the Pooh caught my eye. It was in the price range that I could afford but more importantly, my bride likes these cute little characters. Furthermore, the gift came with a number of balloons and we could deflate them when it was time to board our airplane home. The agent on the telephone was so friendly. She was careful to get all of the details and rehearsed the delivery date and location. I was looking forward to the surprise when it welcomed my bride to our dream vacation. When we walked into our room after a night out with great friends, the welcome gift was sitting on the side table. All of the balloons were inflated and dancing in the air conditioning breeze. Pooh topped the piece with his indomitable smile and cheery eyes. 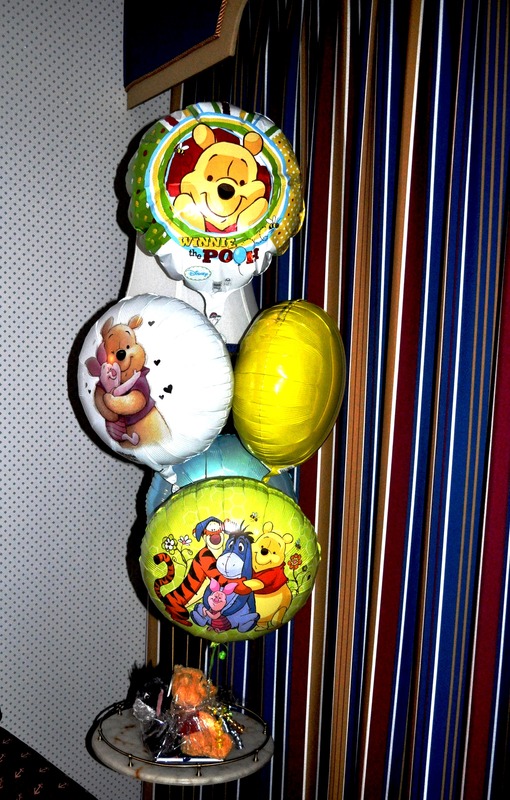 On another helium floater, Pooh is hugging little Piglet. The first balloon was terrific. Both Tigger and Pooh are trying to squeeze some joy into Eeyore. It is a lost cause but their efforts are part of the cheer. My bride not only liked it, she loved it! She sat for posed pictures with this special addition to our journey. Through the night and several days after she smiled at the pictures of her bouquet and thanked me long after the first presentation. Simple gifts filled with color and unexpected but attached to inner delights sure make great memories. I had the job of deflating the balloons on our last day in Orlando. Once flattened my bride took over to fold each balloon neatly into a package for transport home and into our world of nostalgia for years of reliving. It has been years…ok, it has been decades since we have longed to experience the wonderful world of Disney. Much of our life has been on the West Coast so Disneyland has marked our lives several times. However, Disney World in Florida has been an elusive dream. That life list item is now a reality. We landed in Orlando on a Sunday afternoon. It was the fulfillment of years of savings, failed schedules and foiled plans. Now, we went for it. We sent in our check and blocked out every intrusion that threatened to swallow up our vacation dates promised to Mickey. There were a couple of close calls, but we made it to the Magic Kingdom. At the airport cast members from Disney smiled and welcomed us on a comfortable bus. We would not have to rent a car, figure out where to drive, how to drive or where to park. That unique Disney friendliness was striking! Hosts and hostesses jumped at the chance to take care of us at our hotel. They were so friendly and well prepared to manage all of the details for our vacation. 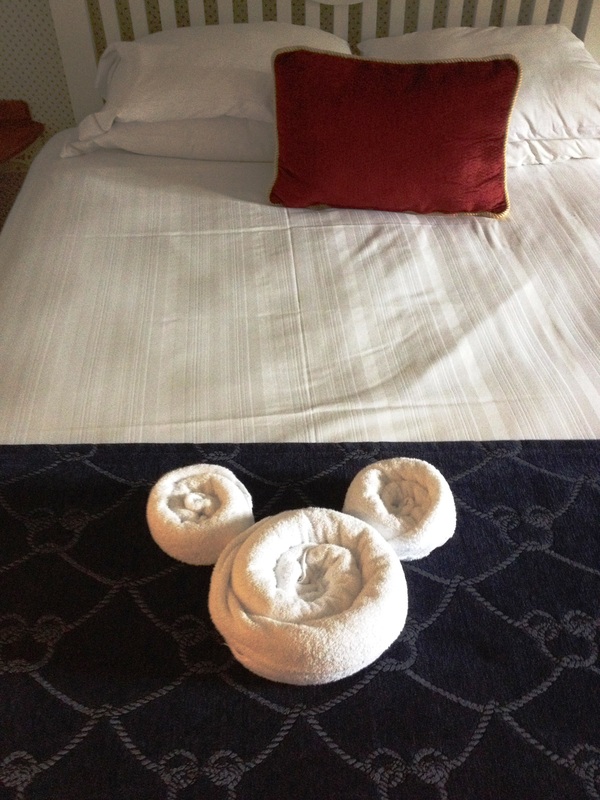 In our hotel room, Goofy left us a welcome voice message. Disney is a great place for kids. It is also just a perfect for adults who still have that kid in them. Yup, that is me! Every where I look there are amazing things to see. That is a certainty. Yet, how the cast members greet and cheer on the guests is breath-taking. Alice skipped towards me. We have never met but our eyes connected. She flashed a huge smile. “Hi, Alice,” I started our conversation. “Nice to see you,” she countered. Next, she was surrounded by children a lot smaller than me. So, I let the little children have their day. The pleasure of a first-hand interchange with a Disney celebrity was too fun. Around the bend a long line was waiting by the shoreline of the Epcot Lake. In the shade of a grove of giant trees, I recognized the costume of a familiar character. It was Belle from Beauty and the Beast. From my vantage point I watched her smile, hug and give lines of great joy to children who took their turns with this famous star of the Disney family. My camera was up and snapping photos. It was just a fleeting moment but I wondered if that last wink was sent just to me. That day thirty-seven years ago was a massive blessing that would grow into enormous proportions. Over three decades later and closing in on four our wedding vows launched us on an amazing adventure together as husband and wife. Together we committed ourselves not only to each other but to our Lord and His calling of ministry. We packed up all of our earthly belongings and loaded it all into my 1973 Toyota pickup truck. It was the basic model. The transmission was four on the floor with no radio or A/C. It would be 18 hours of driving from Hayward, CA to Dallas, TX. Without air conditioning the trip would seem to be much longer, much much longer. We melted together in that searing Texas heat and humidity. Nevertheless, our last year at Dallas Theological Seminary was one of our best. We grew spiritually as individuals and blended together as a couple. Memories and friendships became foundational for us. Over the next three decades we lived the adventure of being shepherds of God’s people, training those whom He called into ministry, traveling overseas for the rigors of theological postgraduate education and reveling in the joy of ministry on a personal scale with people from all over the world. Three amazing children joined us on the adventure. Together we laughed, cried and rejoiced through Oregon, Scotland, Michigan, California and back to Texas. Two of our children found spouses who loved the Lord, our last child finished his graduate school, Yvonne completed her Masters degree, a grandchild was born and we loved and wept our way through several family pets. Our legacy in five children are scattered throughout the West. My bride and I are honored to be in Houston. The seminary that trained me for ministry brought me back to be a part of its leadership team. Team Houston is the second campus of Dallas Seminary. I serve here as the Dean. My bride and I live in Katy. Together we soak in the Texas mystique. We have downsized our lifestyle as couple to match living on the other side of the hill. Whatever God wants we are pleased to do. Wherever He has sent us we have gladly gone. Whatever burden or trial we were called to bear, we trusted Him without balking. 37 years of blessing is a long time but it promises me that He will give us more years to come as we keep on walking in total obedience and immediate obedience to His leading. Happy Anniversary, Yvonne! I love you! This is a special day. We stop whatever we are doing and pause to remember. It is an honorable recollection. For some of us the BBQ grill is fired up. Guests are making their way over to our home. Food is brought out from the pantry and lining the counters. Games are scattered throughout the backyard. Little ones will fill the inflatables, pool or field the badminton court. Space will be occupied by special lives. Sounds will overwhelm the space. Laughter and talking will test our sensory overload limits. Smiles and hugs will dominate our day. Others will have a traditional journey in their day. They will drive to the family plot at the community cemetery. There fresh flowers will decorate the headstone of a dear loved one. Next to the flowers an American flag will be inserted into the ground. This was not just a family member that is remembered. Here lies one who died for his or her country. Yes, Memorial Day is about family and friends. Yes, it is about a day off to relax from the rigors of our labor. Yes, it is about celebrating with food and fun. Nevertheless, at the heart of this day is why all of these moments for fun and partying were made possible. Those in our armed forces who fought and died for our freedoms is the meaning behind this day. Liberty is a costly privilege. Some time during this special day, we can deepen the meaning behind our gatherings when we take a moment to look at our American flag and be grateful. Our thankfulness for those who paid the ultimate sacrifice for us would give meaning to our day. It would inject great value into the remembrance of those who died on our behalf. Then, our gratitude would be a treasured moment. Suddenly, it is not just a day-off but a day of meaning. Life is much more than a time about doing what we want instead of what we have to do. Listen to a patriotic song and feel your spirit leap. Consider the lyrics of our national anthem and be grateful. Treasure the sight of Old Glory waving in the skies above. When the red, white and blue come into view, be a thankful citizen. Smile at the thought of those who courageously squared off with the enemy and beat them in battle. Remember the warm tears of loved ones who buried those brave soldiers in the soil that they won for our liberty. There are high spiritual points along the tour of Israel. Every day and at every site there are those deeply personal moments that people will always remember. But, there are also moments of comic relief that brings a smile to every pilgrim whose feet follows the footsteps of the Savior as well. 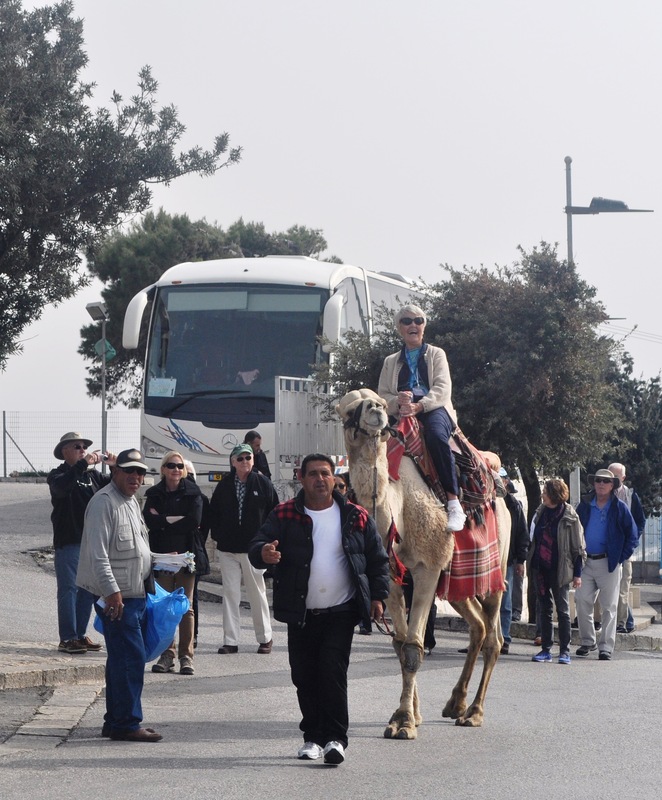 On every one of my four tours of the Holy Land, there is a common laughable sparkle moment. It is part of the land. Also, it is very much a part of the people of the Land. The first time a camel is spotted it rouses an immediate interest on our bus. Every picks their head up and asks, “Where?” Heads are turning and the eagerness in lives both young and old are interested. Cameras are set on the ready. Smart phones with built-in cameras are held up with photo or video options ready to launch into action. All conversations are put on hold and the guide helps everyone orient themselves to the first sighting of this remarkable creature. Westerners have often joked that the best illustration of what a committee can produce compared to that talented executive is a camel. The skilled and gifted individual can come up with a plan to build a Chevrolet Corvette but a committee can never be efficient or productive beyond a hodgepodge of connected good ideas or aesthetic appeal and end up with a camel. That would be a little too rugged of a commentary on this amazing beast. When God created this animal, He designed endurance like it existed no where else in the animal kingdom. 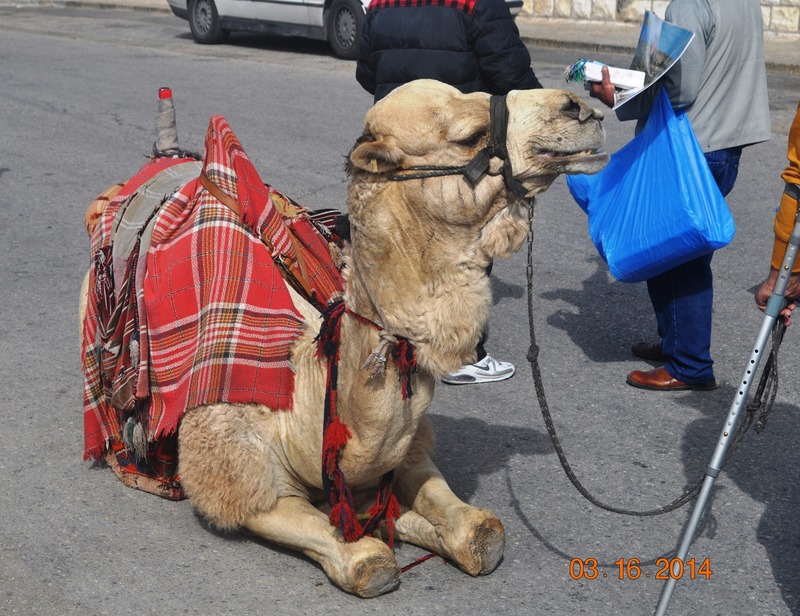 The camel can go and keep on going even through the roughest of climates. In the desert this animal is the king. With its agile movements, personal water reservoir and massive hoof displacement it can travel with a burden through the desert and keep on living. Caravans learned of this quality and maximized its potential. Through the arid and sparsely scattered water sources, these animals deliver their cargo over and over again. Today our guide told us that there are no wild camels. Even in the desert a camel is owned by someone. These creatures are highly prized by those whose lives are in the sandy dunes. Look at the face of a camel. Do they not have a face that only a mother could love? They are gentle yet independent. With their water hump, they always make us pilgrims smile.